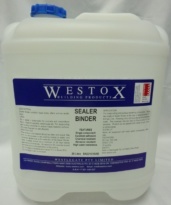 A sealer / dust proofer for concrete and cementitious floors. Used on carparks and warehouses. 4 – 6m2 per Litre. Drying time 4 hours per coat.